The Legion of Super-Heroes is one of my favorite teams in all of comics. I’ve spent the past few weeks covering my personal introduction to the characters, which came in the pages of Mark Waid’s reboot of the franchise in 2005. With issue #16, that series was retitled Supergirl and the Legion of Super-Heroes when Batgirl traveled to the future and joined the team (just testing you to see if you were paying attention, of course it was Supergirl that joined the team). The entire series is well worth seeking out for yourself. 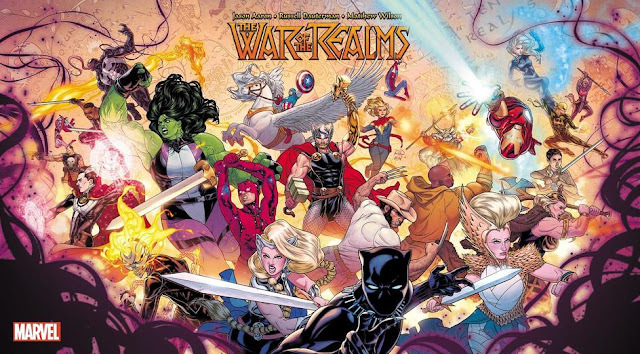 Tony Bedard would take over for Waid starting with #31, and Jim Shooter would return to the book that started his career as a teenager with issue #37 (spoiler alert, it was not very good, despite Francis Manapul art). The book would come to an end thirteen issues later. 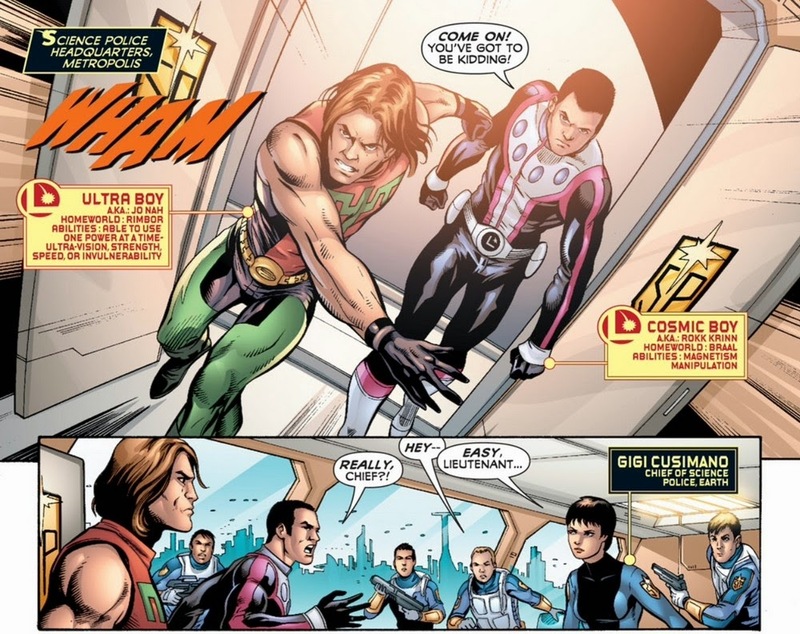 The “Lightning Saga” storyline in Brad Meltzer’s Justice League of America run included versions of Legionnaires that seemed very similar to the original continuity version of the team. That same iteration of the Legion next appeared in the pages of Action Comics battling against a character named Earth-Man (It is probably the best story that has ever had Superman in it). The Legion would then make some appearances in Adventure Comics starting in 2009, as part of the Superman: Last Stand of New Krypton story (which I will never, ever read.) 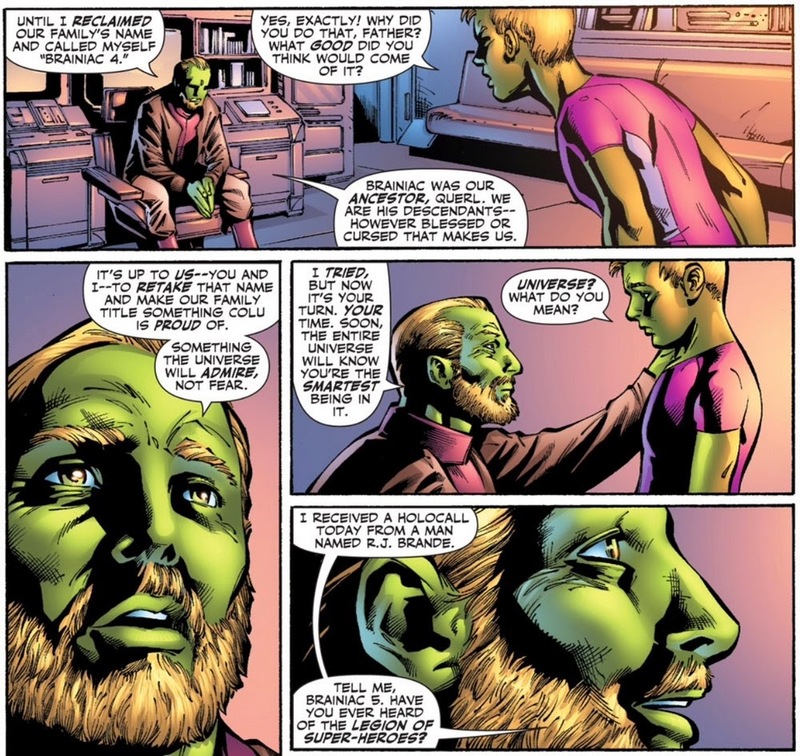 The short anthology style stories did have some great Brainiac 5 character moments, courtesy of Sterling Gates and Travis Moore. Here he is confronting his father over the legacy of his name. 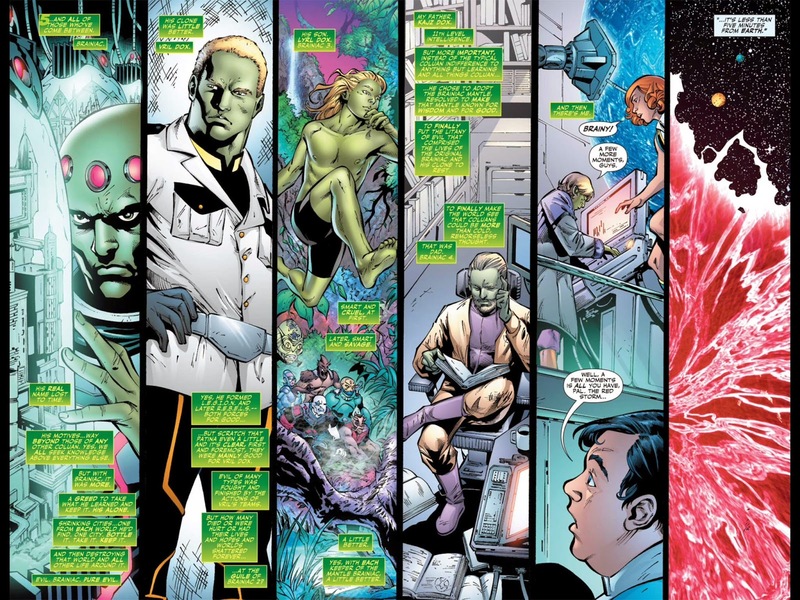 Here’s a quick rundown on the history of that Brainiac legacy. I would later come to love Vril Dox, Brainiac 2, almost as much. Read R.E.B.E.L.S. Also, click for a larger view. 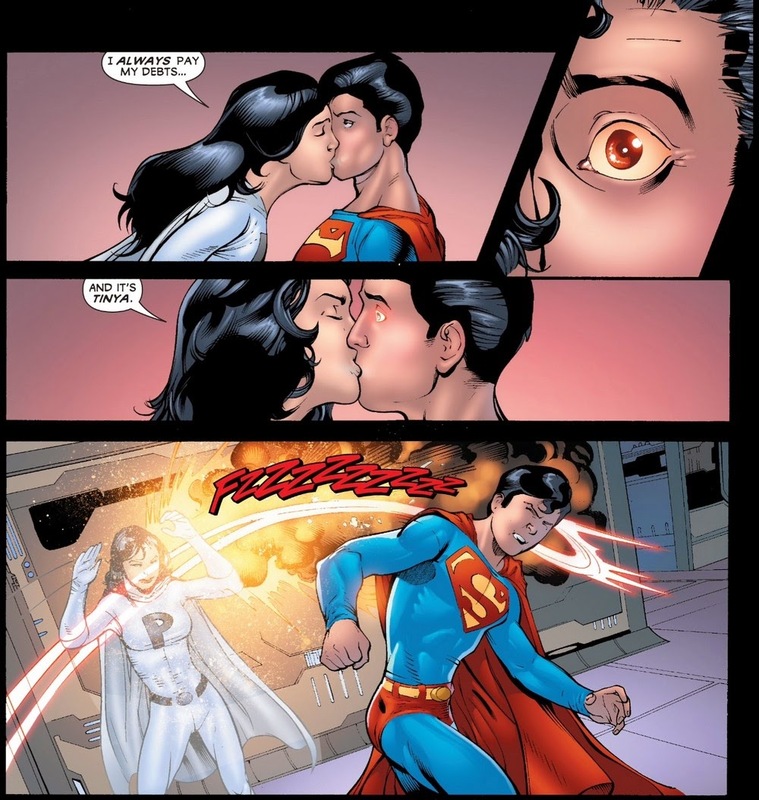 And here’s Superboy spazzing out after getting kissed by a girl. Earth-Man, having successfully seceded the planet Earth from the United Planets during his xenophobic campaign is in captivity having his powers drained by a machine (he has the ability to tap into the power of anyone nearby, mimicking their powers). The two officers watching over him debate the merits of his anti-alien stance (establishing that not everyone considered him to be wrong). Meanwhile, Saturn Girl returns to her home planet of Titan, and visits with a former mentor. Ultra Boy and Cosmic Boy storm into Science Police Headquarters, mad with rage over the conditions Earthgov just made for the Legionnaires to continue operating on Earth, along with the planet rejoining the United Planets. The Legion will be required to take on a new member, and the Science Police will share the Time Institute and its knowledge with outer worlds. I love the little caption boxes the series uses to introduce each character, to include their real name, home planet, and power set. I’m not sure if the Legion books invented that method, but it’s an easy and non-intrusive way to identify all the characters for newer readers, something that is very useful for a series with as big a cast as the Legion. Roll calls in the title pages work too, but that adds an extra element of flipping back and forth that the caption boxes take care of much more elegantly. I’ve seen other books with larger casts adopt this method in recent years as well. In any case, it’s much better than needless introductory exposition dialogue. At the time institute, Professor Harmonia Li and some other scientists put the final touches on their central viewing station, which will allow them to safely monitor any event in history. Back on Titan, Saturn Girl spends some time in her former living quarters, a private place for telepaths, and tries to make sense of the anger she feels for Lightning Lad leaving her and their two children on a quest to find his brother’s twin, who may or may not exist (Lightning Lad’s people are almost always born as twins, except his brother, who was one of the rare single births, which helped lead him to a life of villainy). 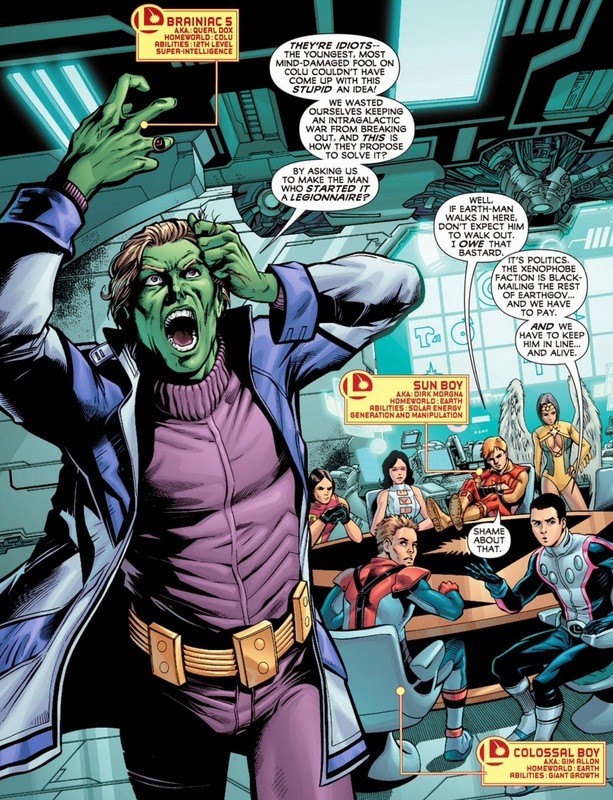 At Legion Headquarters, Brainiac 5 is throwing a fit over the news that Earth-Man will be joining the team, as part of Earthgov’s deal with the team and the United Planets. 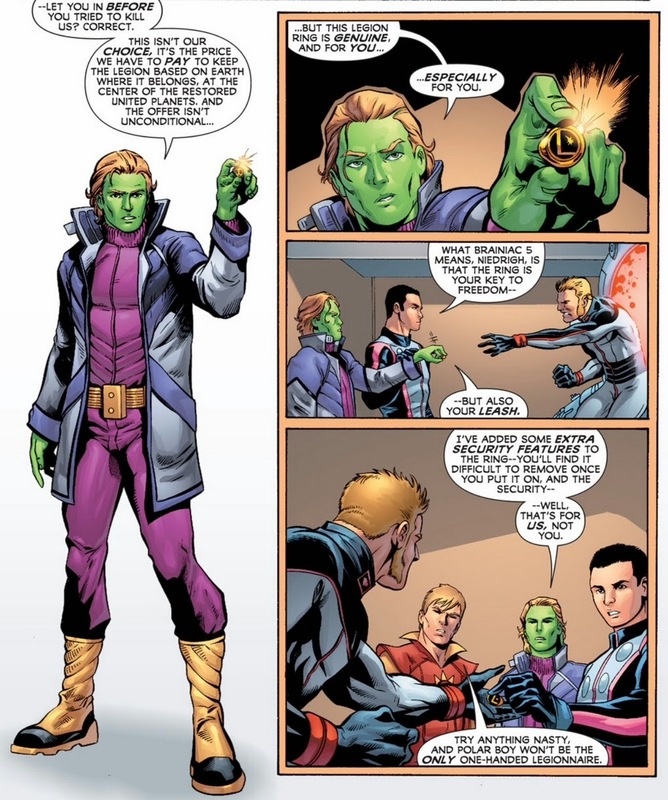 Brainy decides that if they have to give him a flight ring, it doesn’t necessarily have to be an ordinary one. Levitz appropriated Waid’s take on perpetually annoyed Brainy here, and I love it. Returning the Time Institute, the scientists make the ultimate in bad choices by deciding to witness the birth of the universe. 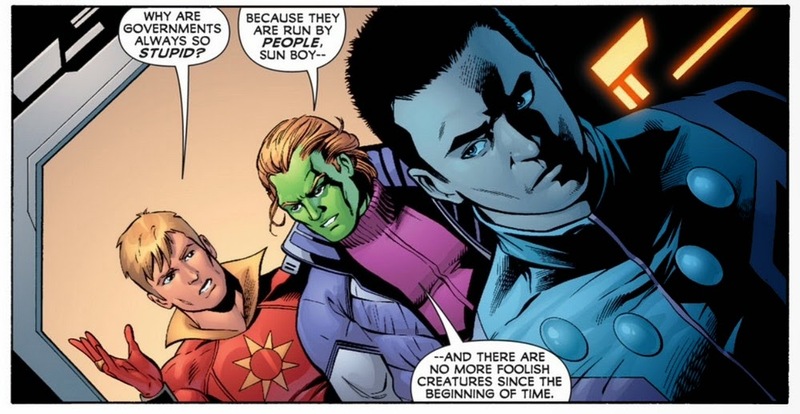 Brainiac 5, Sun Boy, and Cosmic Boy meet with Earth-Man, to explain to him the conditions of the deal and his membership. Either he accepts his special ring, which Brainy has created with some “extra security features,” and his membership on the team, or he stays in prison. Back at the Time Institute, the scientists witness the dawn of time, and of course it all goes wrong. 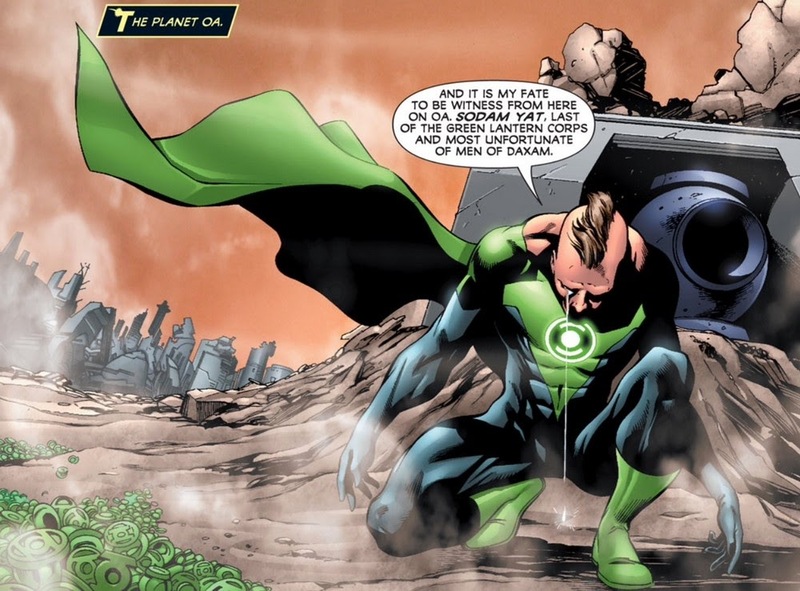 On the Planet Oa, the last living Green Lantern, Sodam Yat witnesses the event, and it triggers a long dormant command from the Guardians for violation of their primary commandment. On Titan, incidentally the location of the Time Institute, Saturn Girl leaves her quarters to the sound of alarms. The energy released from the Time Institute has ripped through the Worldshield, destroying the life support system that keeps the planet habitable. Saturn Girl helps as many people as she can as chaos breaks out all around, on her way to get her children. On Oa, a creature named Dyogene emerges from the ground of the planet and flies off. 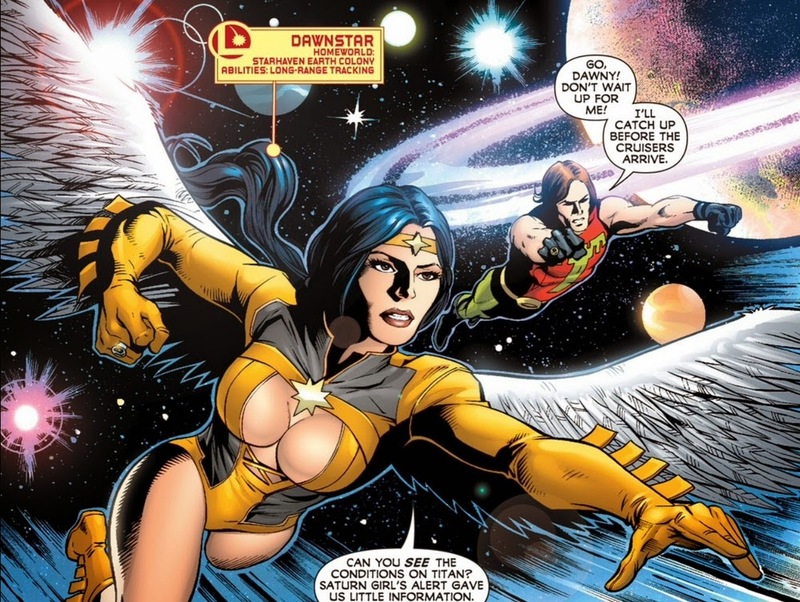 Meanwhile, Dawnstar and Ultra Boy arrive at Titan to help with evacuation efforts. Saturn Girl returns to where she left her children, just in time for them to disappear in bursts of energy. Earth-Man contemplates accepting the Legion ring, when Dyogene comes bursting through the wall. 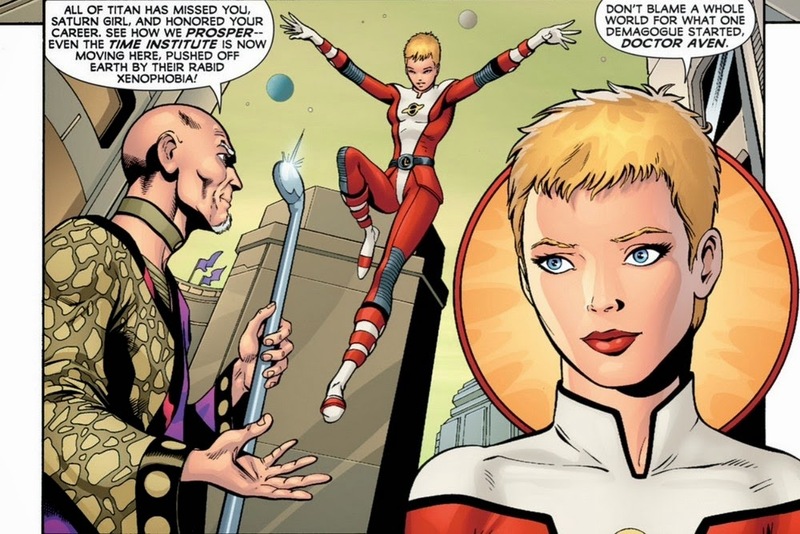 Saturn Girl flies to the Time Institute, believing that her sons disappeared in a time-transport beam. When she arrives, she finds everyone dead, except Harmonia Li. The rest of the Legion has arrived on Titan, working to rescue people for evacuation. 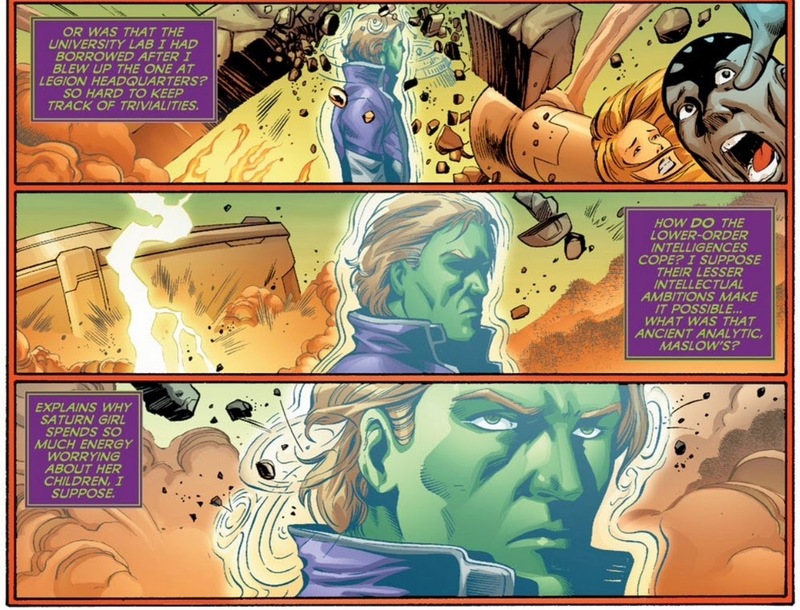 However, Brainy is more concerned with the time spheres, and other equipment, maintained at the Time Institute. He arrives just in time to see Saturn Girl take one of those remaining time spheres, off to find her children. The Legion load up the last remaining evacuees they can, and speed away from Titan as fast as possible before it explodes. As her time sphere fades into the time stream, Saturn Girl hears the cry of every person that didn’t survive, screaming in her mind. 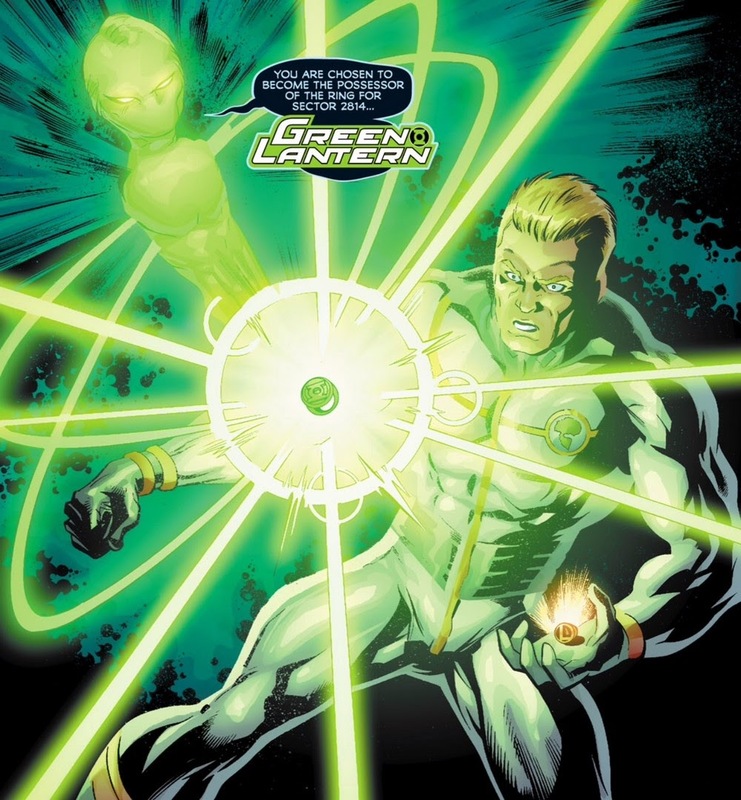 Dyogene attempts to complete his mission from Oa, presenting Earth-Man with a green lantern ring as the chosen representative of Sector 2814. Well, I think I’ve set a new personal record and only covered one single issue this week. Things should move a little faster next week without all the necessary introductions and clarifications. The first issue set up a lot of compelling situations, and you don’t want to miss where those all lead. The journey continues, next week.